After an epic holiday party on Saturday night at the home of Ecoholic with great friends, great food and great tunes, Chris and I expected to get down to business on Sunday and get this attic insulated already. All the weather reports suggested the conditions would be precipitation-free, but we woke up, hungover, to discover that it was snowing. Steadily. All day. So that was FAIL #1. FAIL #2: In my attempt to trim Luna’s toenails, I inadvertently got one of them too short (damn black toes!) and she bled like a stuck pig, off and on all day. We tried sealing it up with Crazy Glue (a trick every good survivalist ought to have in his/her back pocket) but she just chewed it off. I finally ran out to get some styptic powder, which helped, but the trick was to keep her from licking at it. You see, she freezes in a kind of panic attack if you put a buster collar on her (one of those cone-head things) so that isn’t really an option. We wrapped it up, we doused it in bitter apple. It was a day-long affair trying to manage her bleeding toe. And I think it caused Monday’s EPIC FAIL (more on this shortly). FAIL #3: My second batch of French macarons this holiday weren’t exactly an epic fail, but they were yet again missing the proper ‘foot’ and just not the right texture at all. This was after following David Lebovitz’s recipe, in which he chronicled his seven attempts to get them right. They are tasty, yes, and I guess that counts for something. 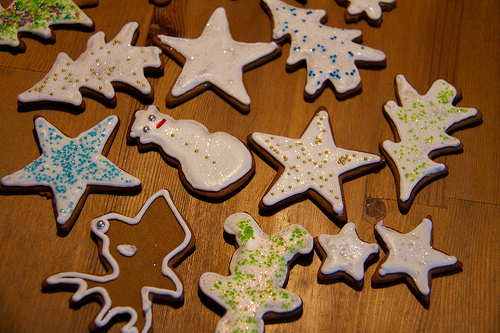 I don’t know if I’ll get another batch going in time for the holidays, even though I swore I would master those suckers this year, and likely I ought to give my poor pancreas a break before I end up in a sugar coma. FAIL #4: Sock with Pints On fails to fit boyfriend as planned — also nearly fails to fit me. After I finished the sock up to about halfway along the foot section, I decided to ask Chris to try it on, so I could see how much length I needed to give his foot. I haven’t knit socks in ages, but I’ve put in my sock time and I am no novice. What I haven’t done before is colourwork socks, socks with multiple strands of colour carried along to create a design. For the uninitiated, it takes some practice to get the hang of carrying your yarn along at such a tension as to avoid puckering of the fabric and to ensure the fabric has the stretch it needs. Stretch being an important factor for socks. Well. I could barely get this sock over my own heel, let alone Chris’s. I’ve blocked it, but I need the boy to bring his feet home from work so we can see where we stand. This was perhaps the most stunning fail of Sunday, and the one that really was the last straw for me. For weeks I’d just accepted that Chris’s Christmas present was going to be late, but then I got started and things were going swimmingly, much faster than I’d hoped. I saw light at the end of the tunnel — I had a whole week to get a second sock done! Plenty of time! But alas. 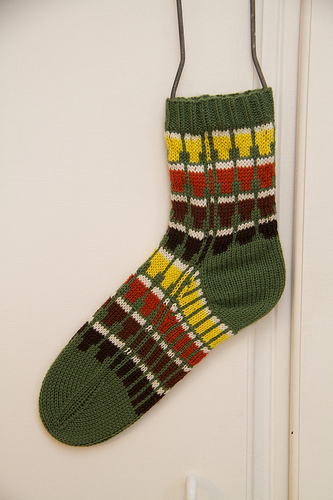 This sock is likely not made for walking (…in…by Chris). So perhaps I’ll be the proud new owners of Socks with Pints On. I do have a plan of attack to start over. I have what appears to be plenty of yarn. I will try, try again, but I plan to expand the pint chart, and I plan to just do the pints on the sock cuff — not the foot. This will mean that the heel, gusset, instep and toes will have lots of stretch because I won’t be carrying along extra colours that could cause more fail. This is my plan, once Chris brings those clunkers home so I can test the lonely singleton sock and see if the blocking made any difference. I thought perhaps our fail streak had come to an end but alas, we were due for an explosion of fail last night. Luna had experienced some runny poops Monday morning but this isn’t entirely unusual for her. We opted to crate her for the day in case she got that toe bleeding again, at least so the blood could be contained to one place in the house. Chris got home early, felt sorry for the pup and let her out while he dealt with his own bodily needs before taking her out. Those 5 minutes proved to be fatal. 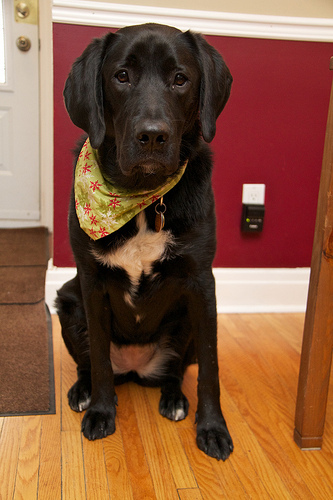 An explosion of canine diarrhea like we’ve never seen before found it’s way into nearly every part of the house. I was out enjoying a beer with a friend when I finally noticed the frantic texts. Poor Chris was running multiple batches of laundry on the sanitary setting, had bathed Luna twice, washed the floors three times and cleaned the rug as best he could, all before I got home, but the house still wreaked of poo. FAIL #5. While he ran out for a meeting I continued to clean the house, the rug at the front door, the towels, re-washed the floor and tried in vein to make the place smell better, simmering some cinnamon sticks on the stove. I was still shampooing the carpet by about midnight. Luna had several messes in her crate despite our getting up in the wee hours to take her out. This morning things were getting much worse and so a trip to the vet ensued. So far as we know it’s purely a stress reaction; we suspect the bleeding toe nightmare might be the cause (so I guess that makes it my fault). Results of a poop sample are pending. She’s had a shot and some pills and some super high-fibre food that should help but as of 3:30 this afternoon she is still needing frequent trips outside to take care of business. Poor girl. She’s all locked up in her crate until we can be sure there won’t be any accidents. Happy start to my holidays! All this to say that if things really do come in threes like they say, we’re all stocked up, thanks. But it hasn’t all been fail. I also ended up with quite a nice beret and matching scarf set for my Grama for Christmas. That’s something. The beret is from More Last Minute Knitted Gifts by Joelle Hoverson, and the pattern is super easy and quite quick. I never thought I was a fan of berets but after trying this on, I just might have to make one for me. 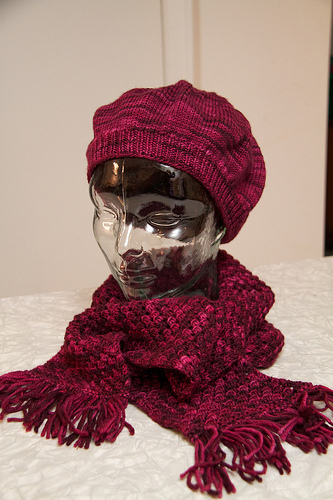 The scarf is a free pattern from Ravelry called Openwork Eyelet Scarf by Jennifer Pace. It was also super easy and the texture is lovely. Let’s hope it only goes up from here.